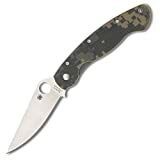 Friday night I was making a tough choice between 2 knives I’ve had my eye on for a while… the Spyderco Military or the Spyderco ParaMilitary 2. I had found great deals on both, but I was getting ONE of them. Literally the only thing that made me doubt the Military is I know it’s way due for a refresh. Think: larger ParaMilitary 2. So I brought in the box, made a fresh coffee, and sat down to open the package. With my trusty Resilience… who has opened many, many packages over the past few months. Caveat: I personally don’t collect anything… (dogs don’t count, they love me!!! )… For me it’s about finding and using cool tools. So my most useful will always be in my pocket. For the past few months, this has been the Resilience. I worried it may be too big at first, but I found the size to be just right… where the Sage was a bit too short many times, the Resilience was “right sized” and just always felt good in the hand to me. Back to our story: Inside the box, sits a brand new Spyderco Military, Camo G-10, Satin blade. Beautiful in a rugged, industrial sort of way. I’ve not held one before (nor a ParaMilitary 2), so it’s been a period of getting acquainted yesterday and today. At first, wasn’t sure… It sure LOOKS a lot like my Resilience. But at the price of 3 Resiliences, I was looking for love, not like. My wife walks into the living room, there’s got shredded paper all over the floor. She looks at me, she shakes her head, she says “you’re cleaning this up”, she walks out. I’m not one to jump on the shiny new toy… it must be truly worthy to unseat the current champion that resides in my pocket. It came ridiculously sharp!! seriously, I’ve not yet seen a knife this sharp. Beautiful. See the confetti remark above. Now, that’s a nice thing, kind of like your new toy coming WITH batteries!! But eventually you’re gonna have to re-sharpen it. I am REALLY REALLY REALLY REALLY REALLY REALLY REALLY hoping that is a smooth process with the SharpMaker per the instructions (straight up and down, not arbitrary slanting lol). Yeah, yeah, I know that doesn’t always work (after the experience with the Sage 1 lol), but here’s hoping. It feels good in the hand. Surprisingly good. Natural. Wasn’t sure at first, but even better than the Resilience. It is surprisingly light… yet damn strong. Bizarrely, it feels as solid as the Resilience, which as more steel on it. Yet it’s far lighter. Odd. The clip. Not talking deep carry and extra subtle clip, just literally comparing it to the Resilience. I would much prefer the smoother, more rounded Resilience clip on this knife. 2 specifics: 1.) I don’t like that it’s black-coated because that WILL chip and come off and look ratty eventually, so I’d far prefer an understated stonewash for example. 2.) it cuts into my middle finger when I hold the handle to flick the knife open. The rounded Resilience one doesn’t do that. (edit: this was resolved shortly as I became accustomed to the Military, now its second nature). To be fair, this is only an issue in shorts where the pocket is very low. With Jeans, my shirt covers it anyway. Those little tiny screws look like they are VERY easy to strip. What “T” is that? I don’t even have that one. That’s it. I’m right handed, don’t care that it’s tip down. And frankly, the above are minor things. This knife is awesome. This is very preliminary, hasn’t been 2 full days yet. After nearly 2 days, I still wasn’t sure… do I love it? Then I looked down… and whadda you know… The Military hasn’t left my pocket since 2 hours after it arrived. My trusty Resilience has been on my desk since then, alongside the Sage 1 (that damn thing WILL get sharp eventually lol… going back to that thread when I have some time in a week or two). Too soon to call it love so early on in a fresh relationship… but I’m not sure what it’s gonna take to kick this thing out of my pocket. I sure am enjoying this knife… day 3 and it’s not left the spot of honor yet. So… it’s been 7 days with the Military. Yeah, the satin/camo “G.I. Joe color” as someone put it last week, which I personally really like. I think it looks awesome, Your tools, it’s what you like, not much else matters lol. I actually really wouldn’t mind a PM2 in the same color scheme at some point. I’ve made peace with the clip… it does an excellent job of retaining the knife securely, while not cutting up your pants. While the knife rides really high, you get an excellent 2-finger grip on it. the only downside I’ve found is in jeans it tends to poke you in the thigh a bit when sitting. Depending on the jeans. In most jeans it’s not an issue. After a week, you have a pretty good idea how you like something. The most telling thing in my opinion is this: what’s IN your pocket? Look down – what’s clipped in the place of honor? For me, it’s not about collecting, not my thing, I just like cool tools. So unless I’m just testing something new for a couple of days, what I’m carrying on any given day is the best I have for that purpose. The Military hasn’t left that spot since I got it. LOVE this knife, it’s the “never leave home without it” knife. Now, I’m a very demanding power user of pretty much everything, so when I find something that lives up to my standards, I tend to be very impressed. The Spyderco Military is such a tool. To be fair, I must admit I’m seriously considering acquiring another knife. What other knife you ask? Why, the same Spyderco Military, but with Low-profile black DLC (Diamond Like Carbon) coating on the blade. At first I was hesitant to get the black blade version, not knowing if the finish would last, but after seeing the quality of this product over the past 6 months, I no longer have any reservations… and it’ll be nice to have 2 of these. This thing carries ridiculously light and small for its size. And it’s ridiculously solid for how it carries. Not sure what it’s going to take to unseat this one from my pocket lol, but it’s going to have to be pretty damn impressive. Get one… you won’t regret it. Spyderco Sage 1 – The Perfect, Stealth EDC Gentlemen’s Knife?